I needed to find a recipe that was easy to double and didn’t use a ton of butter. Butter is expensive! The kids both needed cookies for school – one for a cookie exchange, and the other for after their Christmas program. You can make this dough up to a full day in advance and they’ll taste even better than if you just bake them off right away. I baked off about half the dough last night, so I will get to test that theory! 🙂 I don’t really like using shortening at all, but I had it on hand. The flavor of the cookies is definitely different than all butter, which I prefer. The good thing about shortening is that the cookies remain soft even after sitting out for several hours. Verdict: I’m happy to report that the cookies taste so much better once the dough has chilled for at least 24 hours. It’s like a completely different cookie. The flavors had a chance to meld overnight and completely changed my opinion of this recipe once baked. Thanks for reading, enjoy! 1) In a large bowl, combine the sugars, butter, shortening, salt, vanilla and almond extracts, vinegar, and baking soda, beating until smooth and creamy. 2) Beat in the egg, again beating till smooth. Scrape the bottom and sides of the bowl with a spatula to make sure everything is thoroughly combined. 3) Mix in the flour, then the chips. 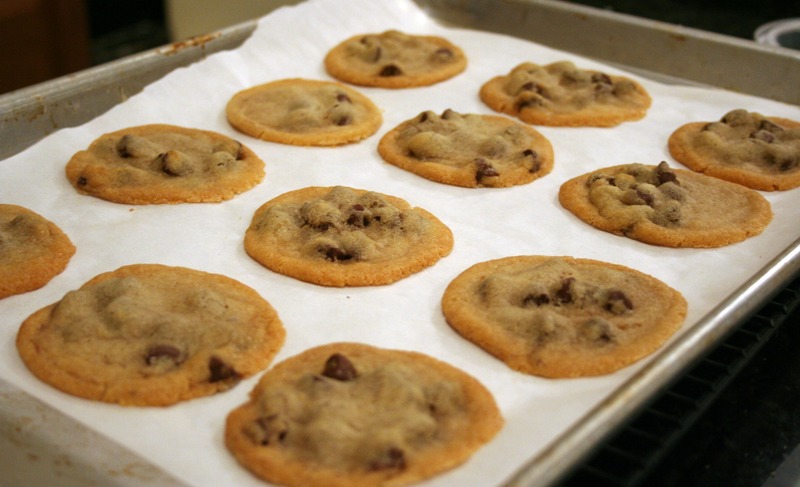 4) Use a spoon (or a tablespoon cookie scoop) to scoop 1 1/4″ balls of dough onto the prepared baking sheets, leaving 2″ between them on all sides; they’ll spread. 5) Bake the cookies for 11 to 12 minutes, till their edges are chestnut brown and their tops are light golden brown, almost blonde. Remove them from the oven, and cool on the pan till they’ve set enough to move without breaking. Repeat with the remaining dough. Those look absolutely perfect! I shall have to try the 24-hour chilling method myself!